A sterilization validation test confirms the appropriate Sterility Assurance Level (SAL) of the medical device. 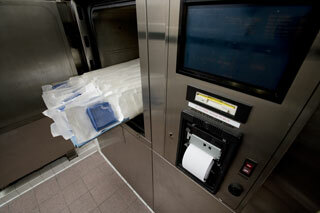 The testing establishes the pertinent sterilization parameters for health care reprocessing instructions. Based on the data obtained through testing, the manufacturer will be able to provide health care facilities with validated sterilization parameters. Nelson Labs can validate using steam (gravity or prevacuum), ethylene oxide (EO), STERRAD® or dry heat, as well as cleaning procedures. An essential part of instruction or directions for use (IFU/DFU) validations is the useful life assessment of the device. This often requires simulated-use studies that mimic clinical conditions and reprocessing. Repeated cleanings and sterilization exposure cycles allow manufacturers to assess end-of-life functionality for their products to ensure safe operation at the beginning, middle, and end of useful product life cycles. Number of samples is determined by the customer based on their post-exposure functionality test requirements. ANSI/AAMI ST79, ANSI/AAMI ST77, and AAMI TIR12 are guidelines for testing reusable medical devices. Nelson Labs has the equipment and qualified personnel to help guide you through the process. Our experts will provide individualized consultation and are here to help simplify the complex regulatory and standard recommendations. Repeat sterilization and cleaning studies are often custom designed based on the manufacturer’s unique cleaning, disinfection, and sterilization claims for clinical reprocessing. Consult with one of our test experts for specific project details. If you have additional questions about Functionality & Repeated-Use Studies, or would like to consult with the experts at Nelson Labs, just send us a request or call us at +1 (801) 290-7500.